The new year according to the Hindu Calendar is celebrated by different names in different states of India. In Assam it is called the Bohag Bihu or Rongali Bihu (ব’হাগ বিহু বা ৰঙালী বিহু) Also called Xaat Bihu, it is a festival celebrated in the state of Assam and northeastern India. The celebration marks the beginning of the Assamese New Year and usually falls in the month of April week. The day celebrates the harvest and is also known as the harvest festival. Bohag Bihu 2019 falls on the 15th of April and northeast India is all prepared to celebrate it unanimously as it is only 2 days away. The day is celebrated seven days after Vishuva Sankranti of the month of Vaisakh or locally 'Bohag' with three primary types of Bihu. Bohag Bihu or Rongali Bihu, Kati Bihu or Kongali Bihu, and Magh Bihu or Bhogali Bihu, are the names of the 3 types of this festival. On this day people make delicious food items to marks the celebrations. Bohag Bihu 2019 Date & Significance: Know History Associated With the Seven-Day Festivity of Rongali Bihu. Made with ingredients such as sesame seeds, jaggery and rice powder this sweet dish is made to celebrate the day of harvest. 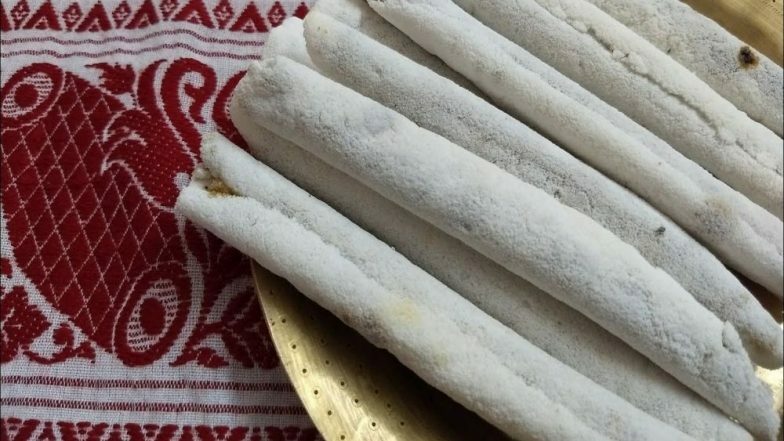 This recipe is similar to Til Pitha except without the Sesame seed. The recipes include coconut jaggery and rice flour. Red Lentils or Dal made with Raw Mango is a special dish made to celebrate Bihu. This season welcomes the king of fruit, Mangoes. This sweet treat is made out of shredded coconut and jaggery or sugar. You can also add nuts to the recipe if you want. Add more sweetness to your celebration with this coconut laddoo recipe. A savoury tea-time snack you can easily make at home an store in jars, Elo Jelo Nimki is absolutely delicious. Another wonderful Indian festival to learn so much from -- Assam's Bohag Bihu. Happy Bohag Bihu to each and every one!